Recirculating the Mash tun and bringing it up to the right temperature for appropriate starch conversion. This is a Dark Mexican Lager and I set the RIMS system to mash the grains at 152 F. This is a 5 gallon batch. The sweet wort is drained from the bottom of the mash tun as it passes through a stainless steel false bottom. The wort is then pumped into an electric stainless steel heating tube with a sight glass. At the end of the heating tube I have a thermowell and a probe that leads back to a Ranco digital temperature controller. The temperature controller reads the passing worts temperature and activates the stainless steel heating bar inside the heating tube when the wort falls below the desired mash temperature. After the wort passes the thermowell it is pumped back into the kettle via a stainless steel sparge arm. Coupon Description: Right now at MoreBeer you can save big on a Brau Meister electric all grain home brewing system. This is the 2nd version of the BrauMeister and if you act now you can save 20% on it. The Brau Meister is a counter top home brewing appliance that produces amazing beer. The Brau Meister is semi-automated. You add the grain and water at the beginning of the brewing process, set your controls, walk away and the BrauMeister handles the rest for you. You are alerted to remove the grain before the boil and later to add hops when needed. One nice advantage versus some other electric home brewing systems is that the Braumeister home brewery reaches and maintains a true boil! That is a key factor in final beer quality, hop utilization and taste. This is the smallest version of the Braumeister which also comes in larger sizes, all the way up to 132 gallons. The exact same controller and technology is used on this smaller version. This is the latest version of the braumeister and it features an updated user interface. The new control panel showcases a large LED screen, allowing for easier recipe viewing and manipulation, as well as a memory bank to actually store recipes for future brews. Some of the advantages of this Speidel Brau Meister Home Brewing system are its small footprint and that is is powered by electricity; no more worrying about running out of propane! This all grain home brewing system is also very easy to use. You mash the grain and then boil the wort in the same vessel which also means for less cleaning then a 3 kettle home brewing system. Coupon Code Description: MoreBeer currently has a sale going on that will save you $500 on one of their famous stainless steel homebrewing sculptures. More Beer makes the very best home brewing systems available and they rarely go on sale. So if you have been looking to purchase one, this might be the time. This is truly the easiest to use all-grain system out there. With nothing electrical to go wrong, simple valves to control flow, easy to view mashtun, and no pumps its just plain easy. The frame of this homebrew rig is made from 304 stainless steel and welded in the MoreBeer metal shop in California. The low profile heavy duty stainless steel homebrew kettles are formed in a mold via the use a punch. This means they are made from a single piece of stainless with no welded seams. These beefy kettles then get an added aluminum layer that is capped with another layer of stainless. The added aluminum helps keep the kettle bottom from scorching and allows for easier cleaning. All the included ball-valves are made from stainless steel. Here are some of the features of this MoreBeer 3 tier homebrewing rig. Sale Description: Adventures in Homebrewing currently has a sale going on where you can save $100 on a Blichmann Home Brewing Brew Easy Homebrewing Rig. The Blichmann Brew Easy home brewing setup is a low footprint brewing platform, perfect for brewers with a small brewing space. This system utilizes a two kettle re-circulation infusion mash system called the KRIMS process. The BrewEasy homebrewing system provides all the simplicity of a brew in a bag BIAB system, but eliminates the cloudy wort, messy lifting, and provides great consistent efficiency! This Blichmann tower of power home brewing system is a great option for brewers just getting started in All Grain Brewing and do not have Blichmann Engineering Boiler Maker kettles, a TOWER of POWER temperature control module, or a pump. The list below shows all the items included in this turnkey system. Coupon Item Description: Adventures in Homebrewing currently has a promotion going on where you can Save $90 On A Grain Father Homebrewing System. 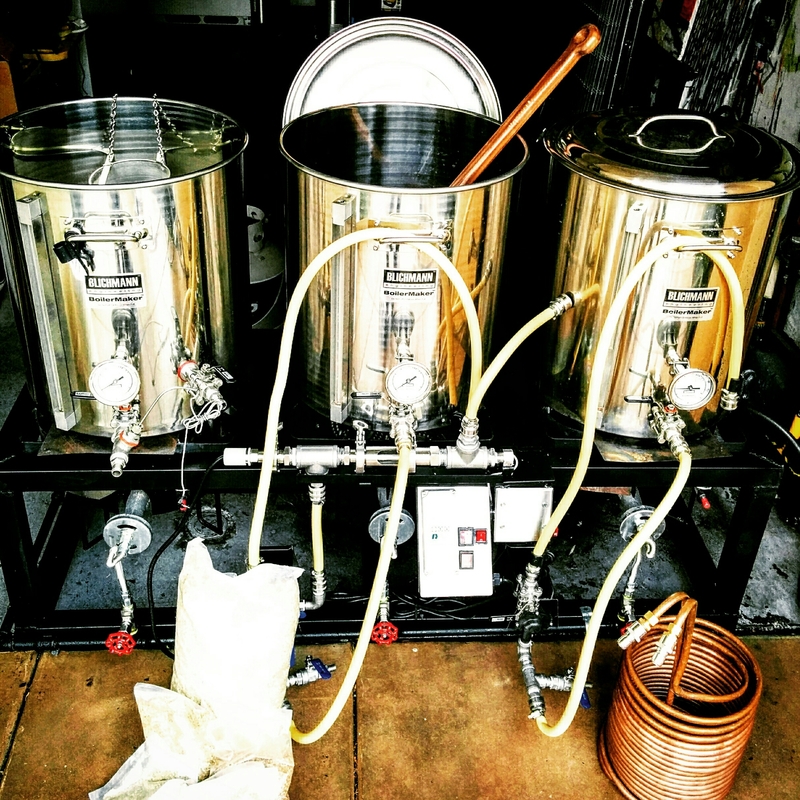 The Grain Father home brewery is an all inclusive all grain beer brewing system. The homebrewing system allows you to mash at high efficiency by utilizing a pump for easy recirculating of the wort through the mashing process. The grain bed is then easy raised out of the kettle to provide for sparging and draining of the grains. Your mash tun then becomes an electric boil kettle. The mash temperature and boil are all controlled precisely with an electric heating element. The system comes with a digital temperature controller so you can adjust temperature of your mash with in a degree. The included pump allows for easy recirculating of your wort during the mash as well as allows for quick cooling at the end of the boil by allowing you to pump through the included counterflow chiller. The GrainFather home brewing system is one of the most compact home brew rigs on the market. Coupon Description: Don’t let your homebrewing pump go bad on you! You should oil most of them at least once a year if not more often. This homebrewing pump motor oil lubricates the moving parts in small electric motors to extend the motor’s life by reducing wear and tear. It is a high-grade oil blend and provides an SAE 20 oil rating equivalent. Increased viscosity compared to standard motor oils provides extended wear protection and its extended drip spout reaches into cavities and enables precise application of the desired amount of oil. Check with your homebrew pump instructions for how often to oil, oiling directions and for the correct oil type.